With a great-and-growing library of games from The Legend of Zelda: Breath of the Wild to Hollow Knight, there's never been a better time to own a Nintendo Switch - and with this new discount on eBay, there's no better time to buy one. Newegg and eBay are hosting a fantastic deal as part of eBay's 11 Days of Deals, offering the standard neon red and blue Nintendo Switch bundle for 10 percent off (a total of $30 in savings) for a limited time only. 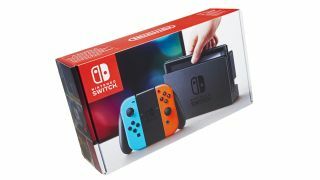 This bundle comes with a Nintendo Switch system with 32GB of built-in storage, a Neon Blue left Joy-Con, a Neon Red right Joy-Con, a Joy-Con grip, a Nintendo Switch Dock to connect the system to your TV, and the dock's required power and HDMI cables. The built-in storage will get you by for a while, but you'll probably want to invest in a Nintendo Switch SD card to expand your space for games and updates (especially if you download a lot). The $30 you save on this bundle will be more than enough to cover a decent sized card. With your memory concerns addressed, you should also cast a bargain-hunting eye toward our guide to Nintendo Switch accessories and snag yourself a nice carrying case. Just because you got your Switch for less doesn't mean it isn't still worth protecting on the road! Keep an eye on our Black Friday game deals for more savings all month long.